So you know we’re working on another book, right? We’ve actually been working on it all year, but now it’s getting down to the wire and we’re working tirelessly to get it turned in on time so it can be done in time for Santa to bring it to you next Christmas. It’s hard to explain what life is like at this point in the process, but let’s just say it’s a little (okay a lot) insane. However, I refuse to get so busy and hectic that Christmas just comes and goes so quick it passes right by me! This is my most favorite time of the year and I love soaking in every second of it. My family has been having so much fun with our Advent Calendar, and it’s really helped me take time every single day to enjoy the spirit of this season, which in turn has helped me stay grounded and relaxed in what could be a super stressful time. People often ask Kate and me how we “do it all” and the answer is, “we don’t!” When things get crazy in one area of my life, I simplify other areas to balance things out. So this month, with a job that’s taking a lot of my time, I’m simplifying my blog posts (and maybe quitting laundry completely, the jury is still out on that one) so I can spend more time doing fun stuff with my family instead! Y’all understand that, right? 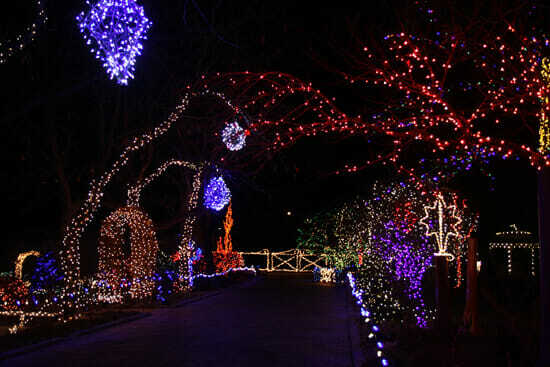 As much as I’d love to spend more hours in the kitchen (after spending the majority of my day there working on cook book stuff) coming up with meals to write out for you, I’d rather put on my hat and scarf and head out to look at Christmas lights with my husband and kids. No hard feelings? So I can’t speak for Kate, but I’m just telling you right now, for the next few weeks you’ll be seeing quick and easy stuff from me- mostly fun stuff I’m doing at home with my family so I think it’s stuff you’ll enjoy too! Because it doesn’t always have to be complicated and time consuming. Sometimes the simplest things, are the most fun! 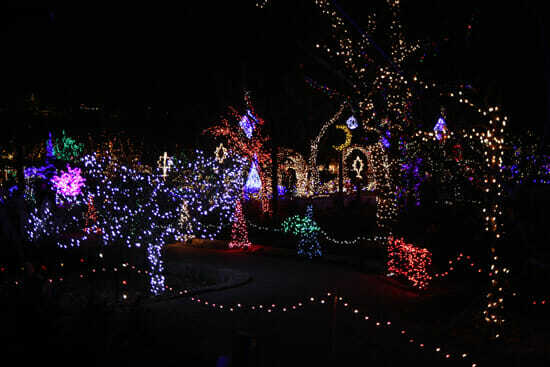 If any of you are in the Boise area, you need to go check out Winter Garden A Glow at the Botanical Gardens. So much fun! Also fun? 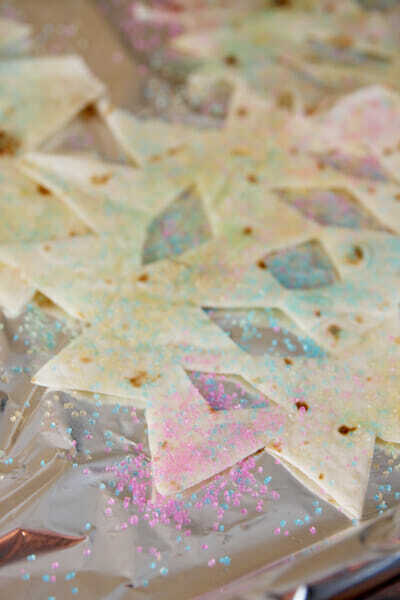 Making giant edible snowflakes. This is one of the fun little activities I had in my advent calendar. Perfect for a snowy day, or a my-kids-have-been-out-of-school-for-too-long day, or any day. It’s perfect to do with kids, but I’ll be honest- I have just as much fun, and they actually taste super yummy too! So grab some scissors and start playing. Any size flour tortilla will work; I’m using small, 6-inch ones. Warm them up in the microwave first; this step is important. 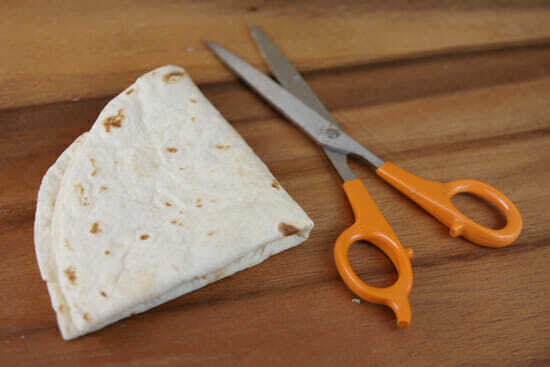 If you fold a cold or even room temperature tortilla it will probably crack and break. Fold it in half and then in half again. You can fold it one more time, like I did, but it gets a little thick, and harder to cut. Use a clean pair of scissors to cut it just like you would a paper snowflake. Obviously you can’t be quite as intricate, but hey- get creative. Then carefully unfold them to reveal your pretties. And then let them sprinkle on coarse sugar sprinkles, or you an use cinnamon sugar, like in our Baked Cinnamon Chips. The great thing is that these actually taste good when they’re loaded with the coarse sugar so if your kids are anything like mine and like to pour avalanches of sprinkles, they’ll be fine. They actually taste super yummy; I think I might have eaten more than my kids did! Eat them plain or break them into chunks and dip them in yogurt, cool whip, or fruit dip for a yummy snack. Preheat oven to 400 degrees. Warm tortillas in microwave until soft and pliable. Fold into quarters or eighths. 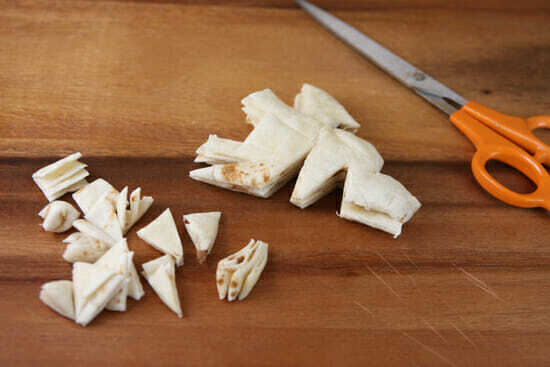 Use scissors to cut out shapes and then unfold. 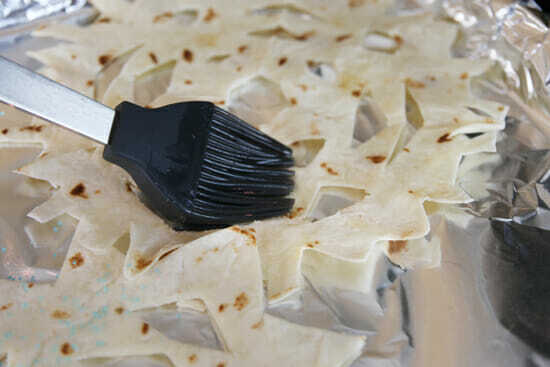 Place tortillas on foil-lined baking sheet and brush with melted butter and sprinkle with sugar sprinkles. Bake for 10-15 minutes, until golden brown around the edges. Cool until easy to handle and eat up. Eat plain or dip in yogurt, whipped cream, or fruit dip. Oh, those are so *pwetty*! I love them! Your babies are getting big too fast. I’m excited about the new book. I only have 2 left in my stockpile of the “old” book, and they are both spoken for as wedding gifts before the year is out. Do you need me to come do your laundry for you? YES. Yes, I do need that Patti. This food craft is just too darn cute! You don’t have to apologize for being super busy right now, we all feel extra busy this time of year and should all slow down a bit. I can’t thank you enough for this idea! My kiddos and I were bored out of our minds today and I just really wanted something Christmasy to do…and here it is! Can’t wait to do this! Those are so fun! I feel like you could also make yourself some weird tortilla chips (or maybe those tortilla things they put on salads) by throwing the cut out pieces in a pot of hot oil. That way there no waste and even more yumminess! Yes, perfect! I just baked up my scraps with some savory seasonings and tossed them on my soup! Quick and easy is always ok! I would love it if you would post your quickest and easiest dinners (maybe AFTER your book is done if even the quick and easy dinners are too much for right now). 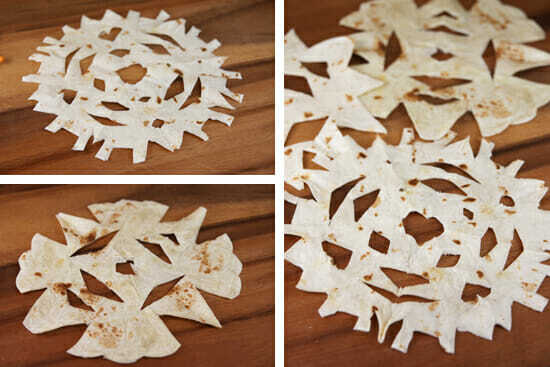 We will be making tortilla snowflakes for an after school snack today and I already know my kids will LOVE it. Thanks for the great idea! 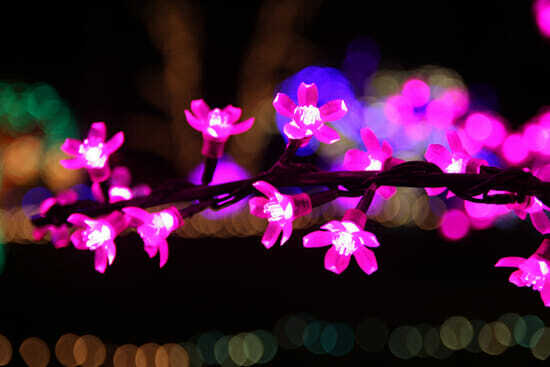 Those lights are beautiful. Thanks for this recipe idea. It’s definitely something I can whip up at home with the kiddos. Doing this today! I’m so tired of vacuuming up little pieces of paper from real snowflake creations. Now I can eat the leftovers! What a cute idea! I will do this today with my little ones! Thank you! I love this! Yet again, you have proven that things can be cool and fun, and simple. I think we all needed the reminder to slow down, relax and take time to enjoy the season. Thank you! Love them with cinnamon and sugar:) Never thought of cutting them into snowflakes!! You guys are just soooo creative!! What a cute idea, and a great way to use up leftover tortillas – 1 just happen to have 2 that I didn’t know what to do with. My son will love this! P.S. When I want dinner ideas, I just browse your cookbook or archives. Considering how much time I spend on your site, I’m amazed that I constantly find recipes that I’d never noticed before! Melissa, yes! I am constantly telling people that- heck even *I* browse our recipe index for ideas, lol! I think it’s fantastic when you post the sweet and simple things that you are doing with your family. That’s part of what makes your blog so fantastic…it’s REAL! 🙂 And of course, it’s a great example for all of us. 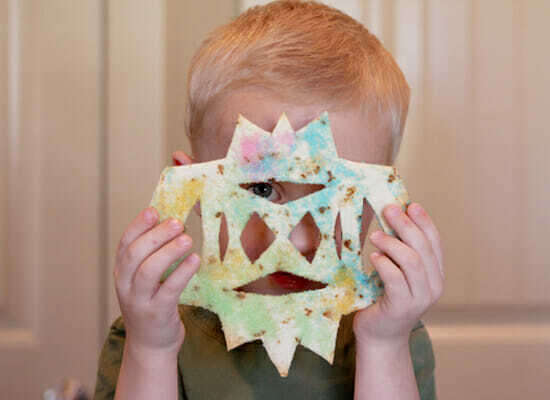 I might even be Mom of the Century today and let my rugrats make some tortilla snowflakes too! Thanks for the great ideas, and good luck with the new book! I’m so excited for that cookbook . . . simplifying the blog posts right now are totally worth it! I LOVE these snowflakes — so cute! I always need help with activities to keep my kids entertained. Thanks! Thank you so much for sharing your creative ideas! My kids will love this! What a cool idea. Definietly going to do this with my 4 year old. We were just in Boise!! Actually we got in pretty late so that place probably wasn’t open at 10:30 pm. Merry Christmas to you!! Simpliest is often the best. I hope you enjoy this holiday season with your friends. And can I tell you how excited I am about another cookbook!! Yay!! I love your blog and cookbook. When it’s my husband’s turn to cook, he always says, “Where’s the Mormom Moms cookbook?” It’s his go-to cookbook. Thanks for all the awesome ideas and yummy recipes! What a fabulous idea! I’ve never heard of it before, but I can guarantee the kids will love it – even my almost teen! SO cute! love it and we are totally doing it this weekend 🙂 thank you!! oh, that’s *such* a great idea! Thanks for the great idea! Can’t wait to try this with my kids… they’ll LOVE it! Where did you get your cute hat? I love anything simple that I can do with my kids so posts like these are wonderful. Though my children are to small right now, I’m going to log this one away for next year for sure! Thanks for the fun idea! Thanks for the awesome post! I think I am going to do these with my students on Monday! BTW, good for you for putting your family and your sanity in a place of priority! I for one, love simple posts but I love even more that you two are able to have boundaries in your very busy lives and you know when it is time to step back a little and take time for what is most important! Enjoy the holiday season and your families! God Bless! How fun! My kids would love doing this. 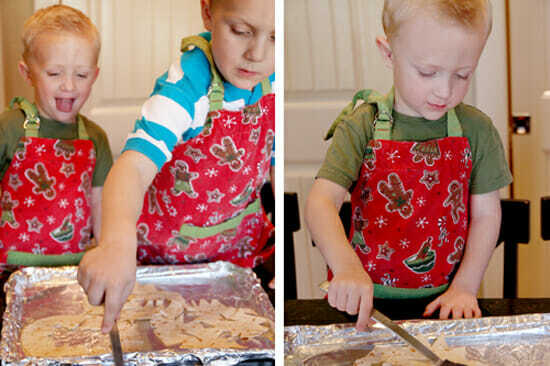 By the way, I love the little aprons your boys are wearing…so cute! Perfect! I needed this post today. I think sometime you should do a post about ideas for when you have a “plethora” of left over eggs in your fridge. I made these with my 3 kids today and we all loved them! Thanks for the great idea!! We like to spread butter and cinnamon sugar on the tortillas and then roll them up after they have been heated. Yum! Sarah, Thanks for the wonderful idea! I’ve been keeping my eyes open for some fun Grandma holiday activities. This one will definitely be one my list. All the best, L.
Instead of folding in eighths, try folding in sixths. It makes great snowflakes (that never come out square) and would eliminate some of the bulk when cutting. This looks like a fun activity. I’ll have to try it out tonight. 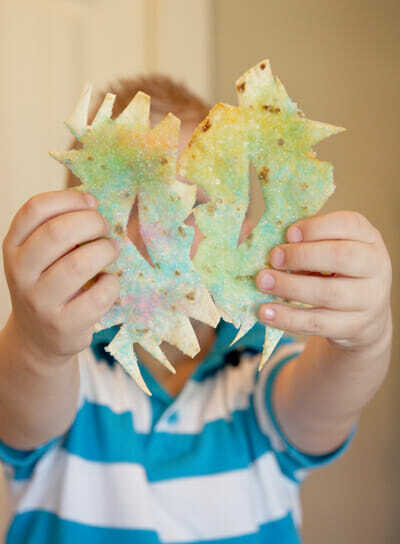 I’m totally going to make these with my kids this weekend (right after I sweep the paper bits off of my floor AGAIN!) And it’s actually REALLY nice to know that I’m not the only one who has those frozen-pizza-is-all-I-can-do-right-now time periods. It’s a good reminder that my kids would rather have super easy meals and a mom that has time to do things WITH them. THANKS! Those are wonderful pictures! And I love snowflakes, how cute are those. Love these! My dad used to call these cinnamon crispas. He would cut them into triangles and put a little bit of oil in a hot pan and crisp them right up, then sprinkle cinnamon sugar on both sides. The best dessert ever! 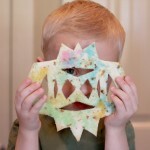 My kids love to make these snowflakes as well! Thanks for the reminder. 🙂 Love your blog! 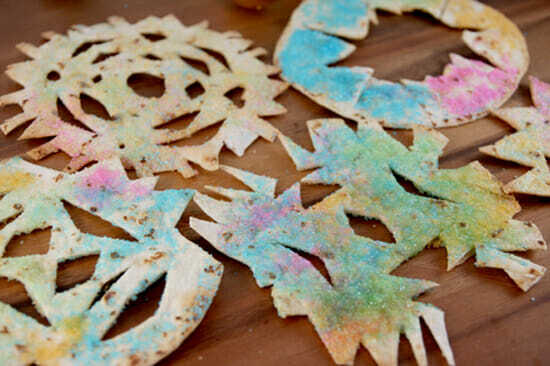 So I am thinking that using the un-cooked tortillas from Costco would make cutting the “snowflakes” super easy! But I am wondering if you think I should cook them on the stove first, then bake them??? It has just been one of those days, where I dont have it in me to figure it out…we all have those days right? Thanks for another fun idea to do with my kids! THANK YOU! You have come up with such a creative idea, not only are your ‘snowflakes’ pretty, they are eatable also. So many ideas I see where food items are used, but are covered with a coating to keep them fresh looking. Where we live, to many people going hungry…and wasting food really bothers me. What a cute idea! My kids will love this! This was in the Friend a few years ago, and we had tons of fun making them. Thanks for reminding me! 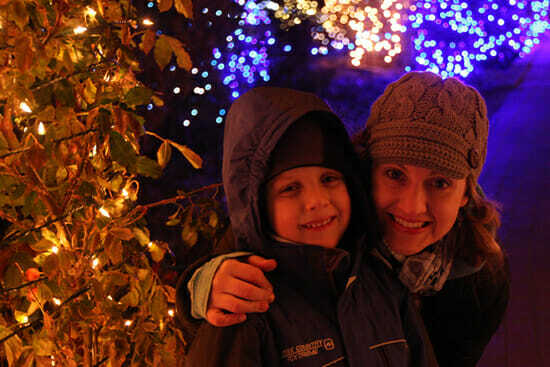 I am going to need some easy, fun activities to do with the kids over Christmas break! What fun these are! I think I’m going to work on making some small enough to fit into my son’s school lunch this week. He’ll absolutely love them! 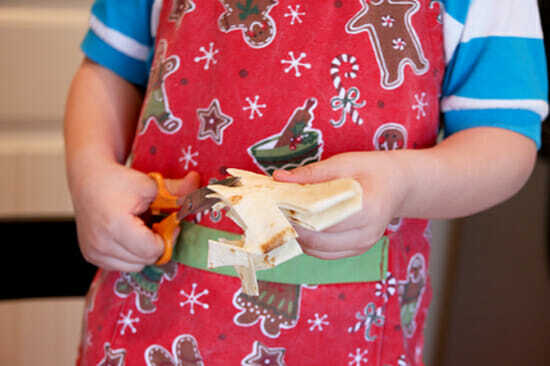 I just printed your Sweet Tortilla Snowflakes recipe, when i read it it truly made me smile I could just see little ones cutting out the tortilla and have so much fun. I think its great you are taking time to reflect on this wonderful time of year! Even your keep it simple ideas are just amazing! Thanks for all the wonderful ideas. I keep you guys on my bookmarked page and check you out everyday. So you have followers in North Dakota! Good luck on your next cookbook, I put the one you have out now on my Christmas list, I hope Santa brings it to me this year 😉 I hope you guys have a lovely Christmas! How incredibly simple and yet FUN! Plus they sound quite yummy. Great holiday idea. Thanks. These look delicious! The photos that accompany this post are simply stunning! I made these over the weekend with my 4yo daughter and she LOVED it! She’s never made the paper snowflakes before so it had even more of a wow-factor. It was a great “recipe” that she could do almost entirely by herself where when we bake, there’s a lot that she can’t (read: I won’t) let her do. She was SO proud of herself. We will definitley make these again soon because not only are they fun, they taste really good too! Thanks for the great idea! BTW- I’ve been hinting pretty heavily for an OBB cookbook and calendar for Christmas. I’ve been very good this year so hopefully my Santa will deliver! Crossing my fingers! We made these for snack and my girls LOVED them! Thanks for the fun idea. We had so much fun making these today, thanks for such a great idea!! How should I store these – just in an airtight container? or should I put them in the fridge? Thank you so much! Made these with my 4 yr old yesterday! I plan to make these again during Christmas Eve with the children. They taste just like Mexican Bunuelos, only easier and faster! Plus a fun way to get the kids involved. I also plan to use cookie cutters to make different shapes. I love your website!!! I just did these with my kids and they were a hit! I tend to be an overly stressed out kind of mom and don’t do a lot of fun things with my little ones lately. But we made plans to do one fun crafty and/or food thing each day this week and this was today’s activity. It was surprisingly easy and as long as I could keep the bottle of sprinkles out of the 2-year-old’s mouth, it went great! The small tortillas were definitely the best size, but the only place I can find them is Bountiful Baskets, and that’s hit and miss. Where do you buy yours…or do you make them? I tried that once and it didn’t end well, but that’s another post! Thanks for all of your great recips and ideas! Looking forward to seeing you for TOFW next spring! I made them for my twins and guess what! They said the wanted me to make like 30 million! Heather my 7 year old and Lyra also 7 (twins like I said before) can even make them themselves though they need a little help with the oven! what a great idea to add to the Christmas cookie trays my sister and I give out to the neighbors! I am also thinking of using this idea to make lace hearts and put red sugar on them for a Valentines day surprise for my finace and sister! ❮ Previous Post Previous post: Smucker’s Orchard’s Finest Giveaway!